Good day fellow investors. Can you invest like a hedge fund manager. And can you invest in their own picks. So the SEC commission the best first airfreighted relation where U.S. hedge fund managers have to disclose their positions usually 45 days after a quarter has passed. So every time 15th of February so now we'll start seeing okay what did Seth Klarman buy What did Warren Buffett buy. What did Warren Buffett sell etc. David Einhorn, Loeb and all the other big shots in the environment will show what they own and many follow there. OK. He bought that. The price is even lower. Now let me jump in in that position it must be good. And in this video I want to discuss OK whether there is that is a smart strategy or not. And how you can imply that and what you have to think about the first thing is as I said everything they do is delayed and you get the information delayed. And even if it is something very important for them they can require from the SEC to not disclose that position until they have fully made the fully position because they can move the markets. So that's also something to keep in mind. Not everything is out there plus short positions are not out there positions less than a certain amount or smaller stocks are not out there because they can move the markets. Secondly there is no short position. You never know whether a hedge fund manager went long and short David Einhorn. He says it later but you cannot see it. He's I think long what was General Motors and short Tesla. So it is a long short position. Something that you cannot. No further merger arbitrage. So you see a fund manager being long Bristol-Myers of chair Celgene with their merger but to take advantage of the spread there. But you never know how much is long in relation to how much is he short the other stock to get the advantage of that merger arbitrage. So also something retail there really cannot know and cannot do. And I received a lot of questions about this merger. What is the chance there. And there is always with mergers. Buffett's answer is always the best. If the merger doesn't go through are you happy holding the stock at what you paid. If yes then you can play on merger arbitrage. If not you better stay away. Furder Seth Klarman recently the bankruptcy chapter 11 situation he invested a lot over the last year into that and many say he lost a lot of money but we don't know whether he was short the bonds whether he bought the bonds or whether he would make a lot of money or something else no matter what happens there we don't know what he long his short positions so don't feel like OK he's invested there. I can invest with him. Secondly I'm not a lawyer to answer that question so I don't know what will be the implications of the Chapter 11 of the value there what can happen and what is his longtime solution and that out there or he can simply have made a mistake. So it's a lot of unknowns there and I simply cannot answer them. And if you think you can answer those questions if you know OK why Seth Klarman bought this stock why someone from the Reath Renaissance Technologies bought this stock then. Save yourself the trouble of buying 20 stocks. Send them a letter which are explanations and I'm sure they will hire you. You will have a one hundred thousand two hundred thousand jobs per year and you will do the same and you will not risk your money on a few stocks. So the Renaissance technology as someone said a comment about that I have a Ph.D. why should I ever disclose that. I don't know I did that. So I do it. But Renaissance Technologies they have about 300 employees 150B.H. These are not in finance in all other sectors method takes physicsetc. But if you want to invest like them you have to understand what they are doing. Ray Dalio always says don't look at one of my positions because you cannot understand what else it is connected. So he was short days or dead or long that but you cannot understand OK what's the whole picture there. And he's all where their portfolio is pretty complex and I keep telling people. Fifteen hundred people work on that. So if you can understand his positioning simply get a job with Bridgwater do that and you'll do fine. Trying to balance those things out is very very hard. 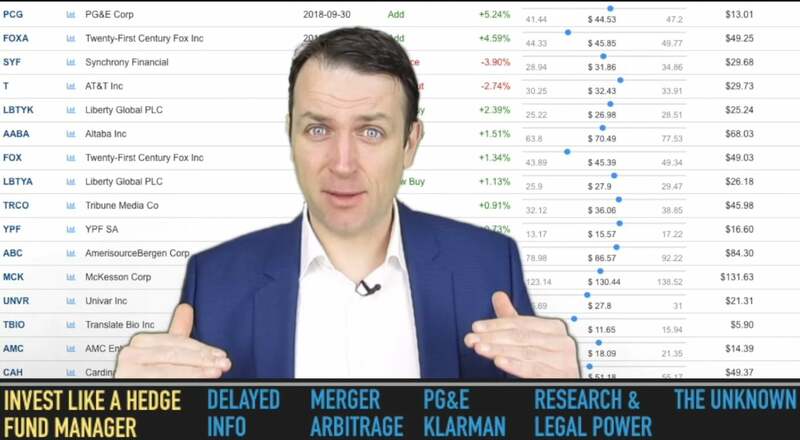 So the message of this short video when you look at all those hedge funds and what they are doing and when you will be and we will be looking at OK what they buy what they sell. Try to always look OK what part of that transaction.